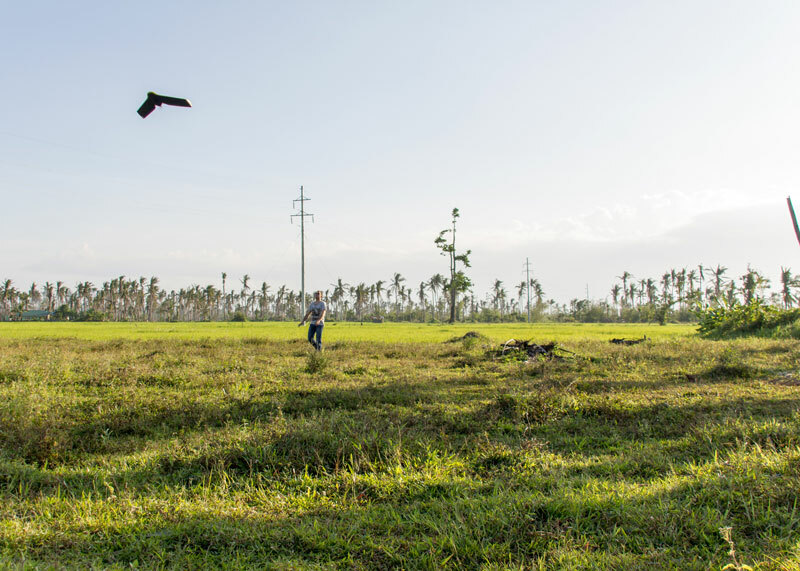 A drone’s eye view of the many coconut trees that were uprooted when Typhoon Haiyan struck the Philippines. 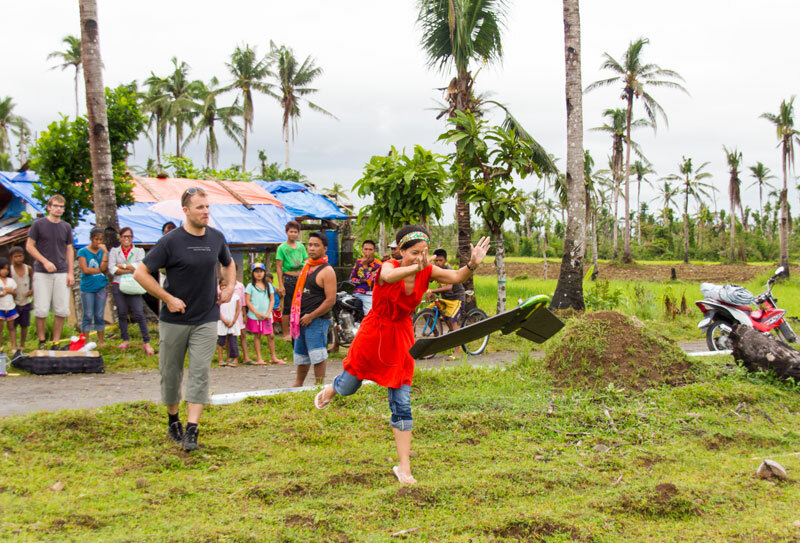 Six months ago, Typhoon Haiyan devastated the Philippine’s South East coast. Now Drone Adventures is helping the reconstruction effort by providing much-needed aerial maps of the region. 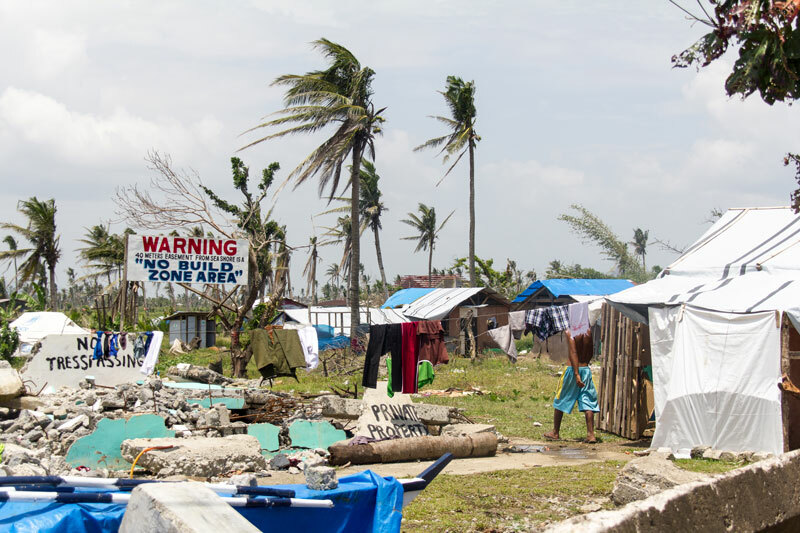 When Typhoon Haiyan, known as Yolanda in the Philippines, struck the South East coast of the country six months ago, on November 8, 2013, it devastated entire communities – tearing apart thousands of homes and destroying livelihoods. Many of those worst hit were ‘informal’ unplanned homes, situated at or near the water’s edge. One of the humanitarian organisations that stepped up to help was Swiss-based Medair, which is dedicated to relieving human suffering in some of the world’s most remote and badly affected places. 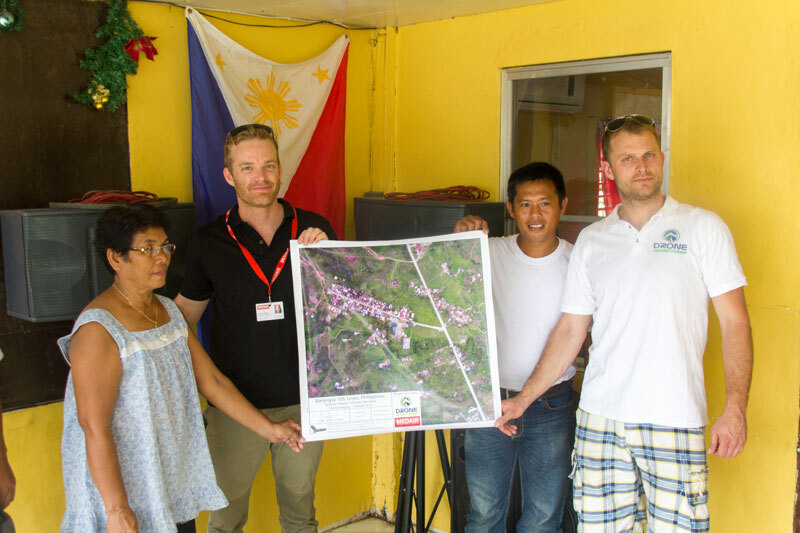 However after arriving in the country just 48 hours after Yolanda struck and conducting their initial assessments, the Medair team soon discovered that accurate, up-to-date maps of the region didn’t exist, with communities often having to rely on either hand-drawn maps or outdated Google versions. 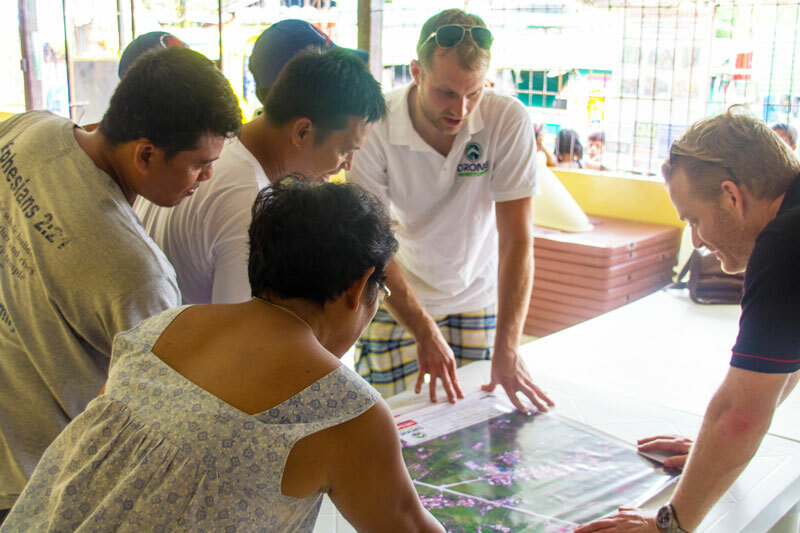 We then further expanded our activities, visiting different communities on or near the East coast of Leyte island and providing leaders with physical high-resolution maps they could use to assess the situations in their communities and plan reconstruction efforts based on current, accurate data. Damage from Typhoon in Haiyan (also known as “Yolanda”) in Tacloban, Philippines. Thousands of homes were partially or completely destroyed by the typhoon and subsequent storm surges. Known as ‘Liberation Town’, Dulag is a settlement of 50,000 residents, located 36 km (22 miles) south of the administrative capital of Leyte island, Tacloban. Typhoon Haiyan made landfall just south of Dulag. 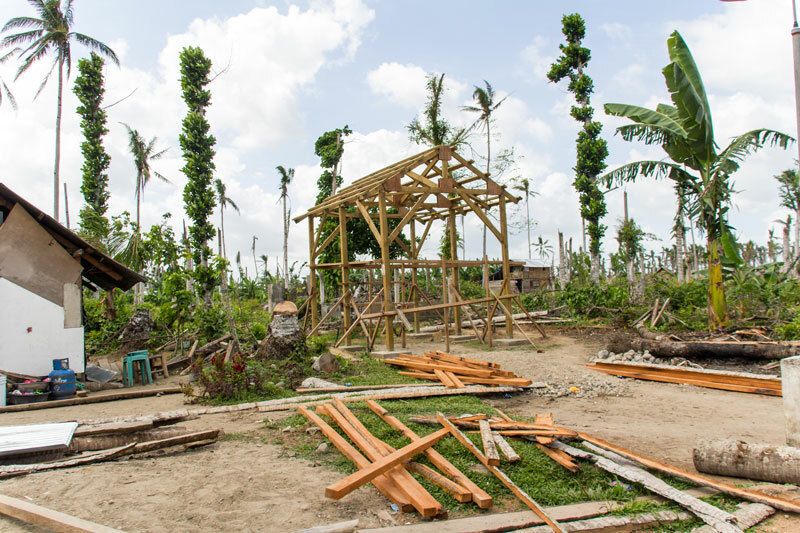 Dulag was where Medair started its work, rolling out a project to provide the most vulnerable families in the municipality with what the organization calls ‘core homes’. These dwellings offer a family disaster-proof foundations, a strong wooden frame, and a roof. But that is all. Each family must then – with support from Medair – take ownership of its future by completing the rest of the home itself by creating all the walls, floors and interior features they require. 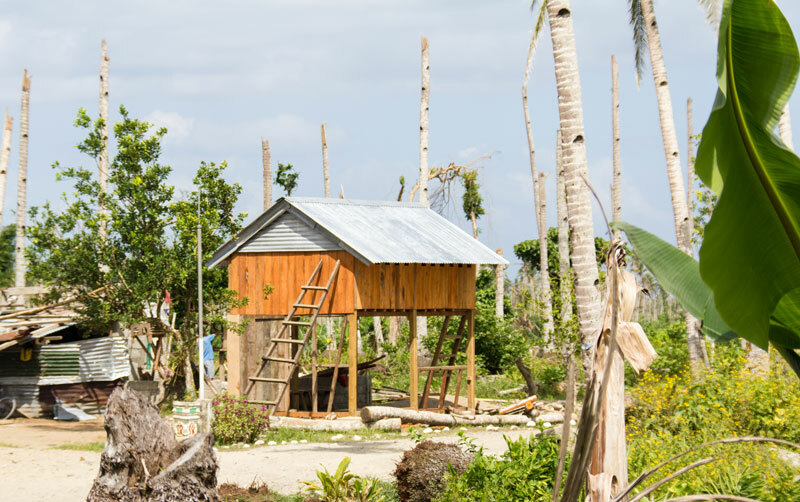 To date, Medair has built 600 shelters, providing 3,000 people with homes. When Medair first contacted Drone Adventures, its team had already started to collect geographic data, marking down for example the GPS co-ordinates of homes in the area and recording family details for each. However what staff were missing was up-to-date, high-resolution base maps that they could use to assess villages, see where people are currently living, monitor reconstruction work and more. The Medair team did have access to existing local maps, produced most likely through local ground assessments, however these were not geographically accurate, for example in terms of road locations and distances. An existing map of Dulag municipality. Click to zoom in and explore the high-definition orthomosaic we produced of Dulag. One of Medair’s core homes under construction. Another home, already provided to a family and quickly taking shape. Medair staff were also keen to assess the local environmental damage caused by Yolanda, since many local livelihoods depend on natural resources like coconut trees. Many of these trees had either been decapitated by the typhoon or completely uprooted, with whole forests completely wiped out in some areas. 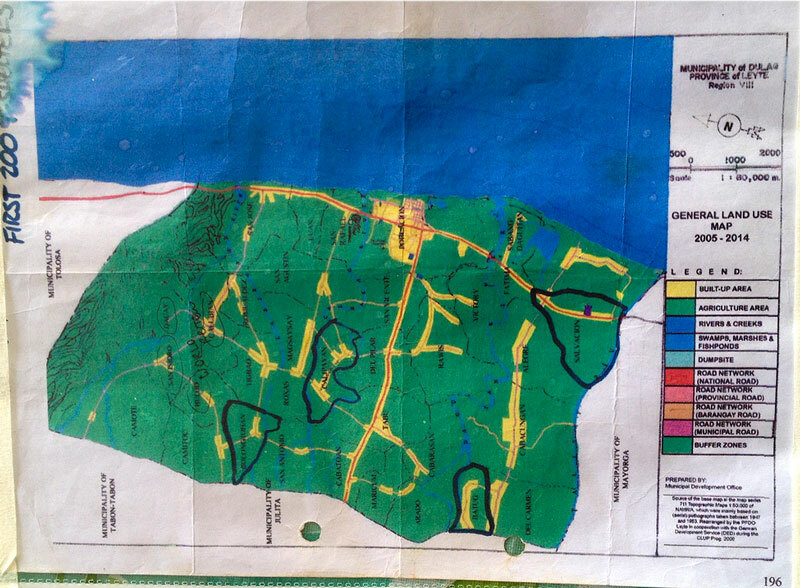 Therefore we also mapped these regions, shown below, as part of our work in Dulag. The white lines shown here are uprooted coconut trees, which form the livelihood of many residents in the Dulag municipality. In addition to working with Medair to assess storm damage and create base maps, our team also produced physical maps to gift to four different communities on the island: Barangay 105, Julita, Dulag and Cabacongan. Our approach before arriving in a new area was to start by getting local buy-in. So we would first contact the local ‘barangay’ (barrio) captain – effectively the village mayor – to explain who we were and what kind of data we could offer. The response was always positive. Leaders were excited by the opportunity of having their own accurate maps. Captains and their teams might only be using hand-drawn maps at present – never mind having computers with internet access – but they all understand how much value up-to-date, highly accurate geographic information can bring and the transformative effect proper maps could have on their work. 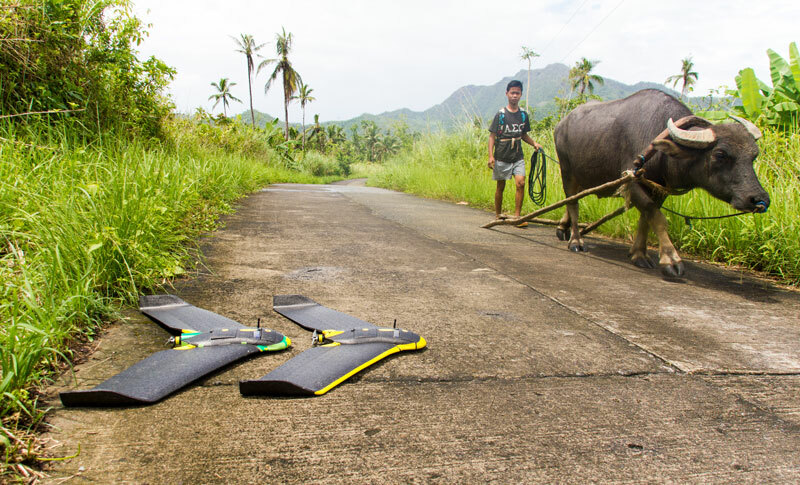 Mapping with a drone often turns into a community-wide event. 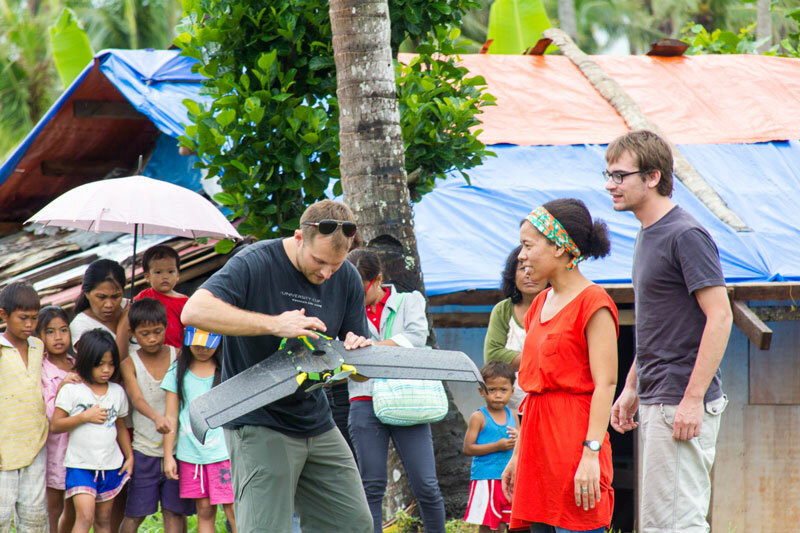 A Medair team member launches a drone. Our typical workflow was to arrive on site in the morning, fly our drones, and then, in the evening, process the several hundred images we had acquired that day. We would then visit the nearest local print shop and print the resulting map on a giant tarpaulin sheet, presenting this to barangay leaders the next day. It is difficult to overstate what a difference it makes to give a community a real, physical map. With a large high-resolution photo in their hands, people have something they can gather around and start using right away. And while many towns don’t have staff on hand who know how to work with geographic information systems (GIS) – and outputs like 3D digital surface models – everyone can appreciate and benefit from an accurate bird’s-eye view of their community. 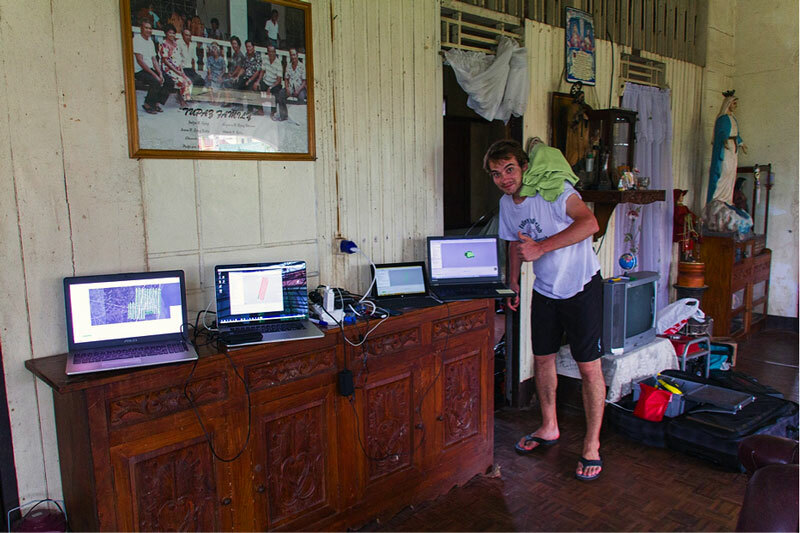 Image processing back at our Dulag base. Presenting our map of Barangay 105 to local leaders. Before we left the Philippines, we headed further north to Tacloban, the capital of the Eastern Visayas region, to meet Mayor Alfred Romualdez. The city is home to 200,000 people and was all but destroyed by the typhoon and its resulting storm surges. Numerous families lost their homes, particularly those who had built in unsafe, unplanned locations – so called ‘informal’ developments – near the seafront. A new planning law bans the building of homes within 40 meters (131 ft) of the waterfront. 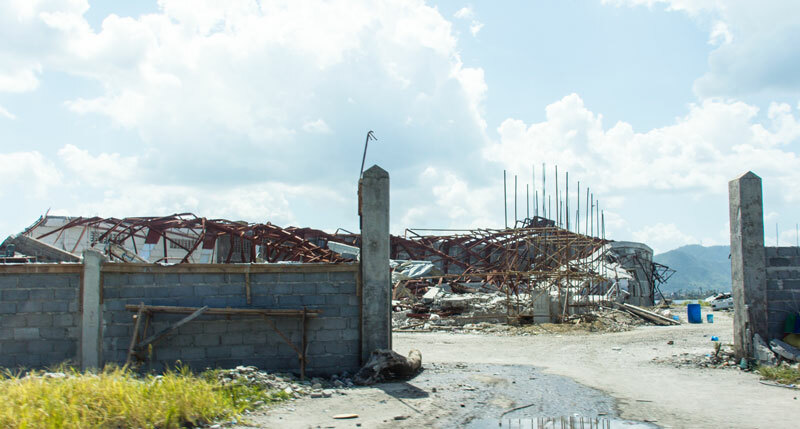 Following the creation of a new planning law that bans the building of homes within 40 meters (131 ft) of the waterfront, the mayor had assigned a large unused plot of land, near Barangay 105, to re-house displaced families. This area is sub-divided into numerous plots, which are individually sponsored by a range of donor organizations from around the world, each responsible for building a section of this resilient new community. Since the mayor’s existing map of the region was far from perfect, our goal role was to produce a high-definition image – hosted online – which both Mayor Romualdez’s team and donor organizations could use to make better decisions and more accurately direct rebuilding efforts. Several drone flights later and the two images below show the difference in accuracy achieved between the mayor’s previous plan and his new drone-sourced image of the same area. 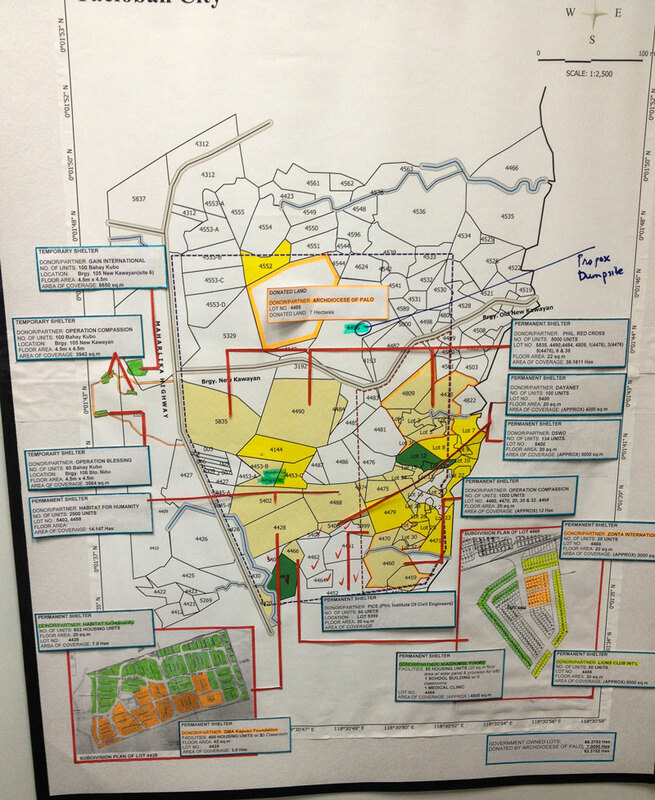 Mayor Romualdez’s previous map of the new Barangay 105 settlement. 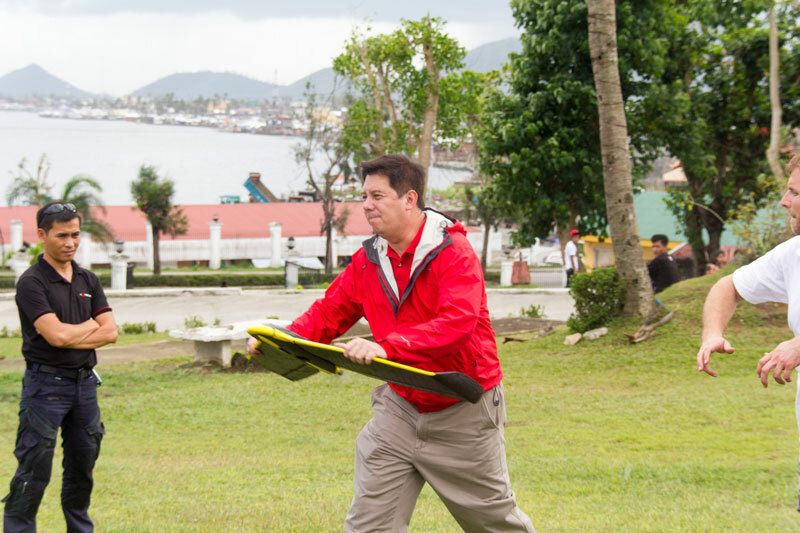 Mayor Romualdez learning about mapping drones. 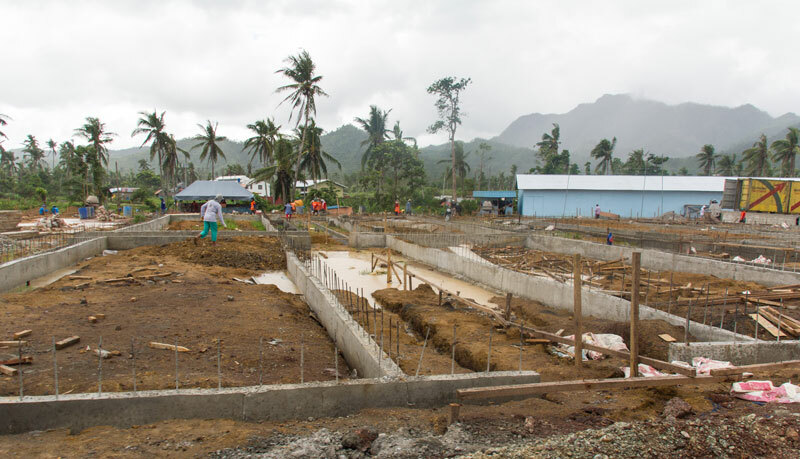 Development in action – foundations being built just north of Barangay 105. During the course of our six-day trip, our two-man team, together with our Medair partners, flew 29 drone mapping flights in total with a combined flight time of 11.6 hours. We mapped 48.6 sq km (18.8 sq mi) of land and acquired 5,139 images. These images were used to create four high-resolution maps – of Barangay 105, Cabacongan, Julita and Dulag – plus seven additional low-res versions of surrounding countryside. The typical ground resolution of these orthomosaics was 5 cm (1.96 in) per pixel for villages and 8-10 cm (3.1 – 3.9 in) for larger areas. Drones do not have a good reputation. People associate them with the military and think of them as weapons, but they can also be used for good. 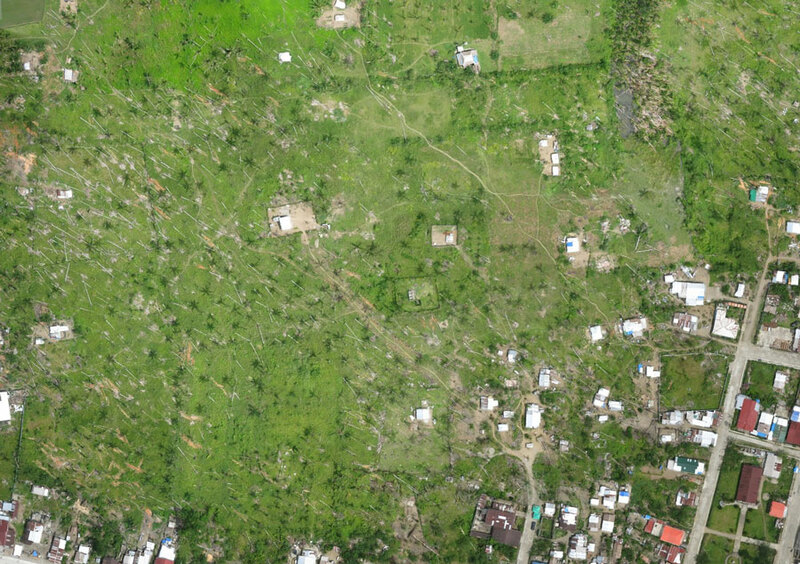 We are using the images taken by the drones to carry out damage assessments, to identify land that could be safer to relocate families to and to see where recovery efforts are taking place. 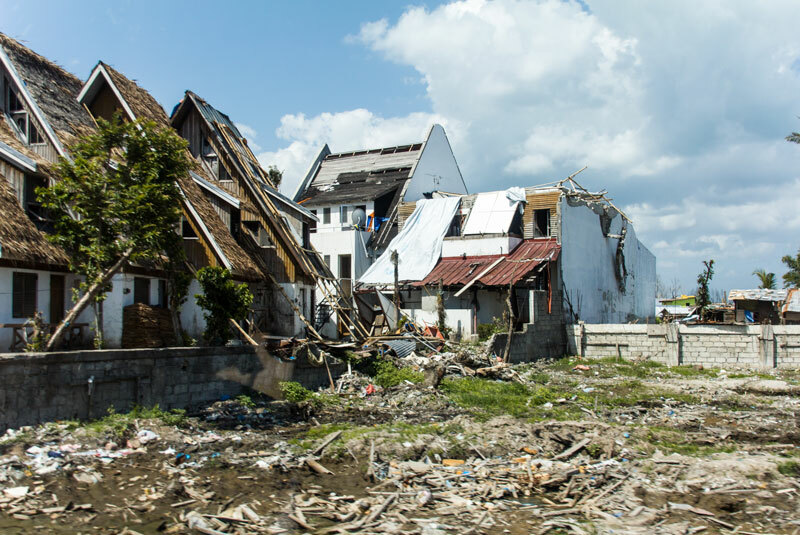 Relief organisations are increasingly using drones to provide services not otherwise possible, and we intend to use them in response to future emergencies. 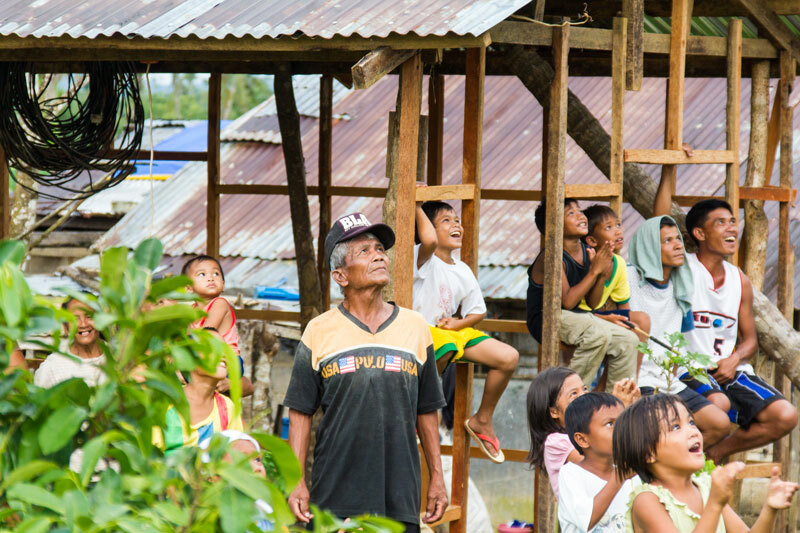 Read Medair’s report on its work in Dulag. The Drone Adventures team used senseFly eBee mapping drones and Pix4D software for data processing and orthomosaic generation. A special thanks to our friends at Mapbox for hosting all our data online. 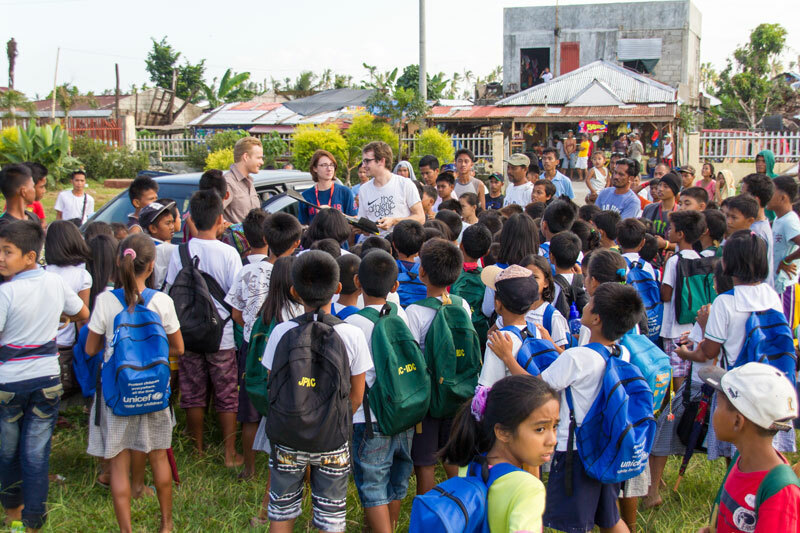 For more photos of our Philippines mission, check out the full photo gallery.